One size fits all. Forms to all face shapes (even works with beards). Adjustable nose piece shapes easily to seal dust out. Heavy 3/4" elastic with a buckle provides strength and the top strap is easily adjusted. Hook and loop fastener on bottom strap provides maximum comfort and ease of closure. Hand washable and may be disinfected for use by more than one person. Easy to breathe and talk through. Perfect for teachers and demonstrators. Effective down to 3 microns. I have been wearing one of these masks for 5 years while sanding on the lathe and have found them to be pleasant to wear. It has cut down my allergic reaction to certain timber dusts considerably. Remember, it is the dust you cannot see which does the damage. No more going inside after a day’s turning and blowing your nose to find half the workshop dust in your hooter. They are especially great as I wear glasses and they don't fog either. 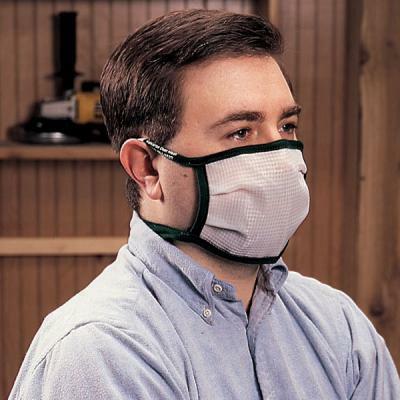 Developed by a woodturner who was tired of ill-fitting disposable nuisance dust masks, the new Dust Bee Gone Nuisance Dust Mask is a washable, re-useable mask made from a patented interlaced monofilament material. This mask will last far longer than your everyday disposable dust mask. The Dust Bee Gone website claims: "Our test group is still using their original masks with continuous use for 4-1/2 years." Postage for overseas orders by quotation. Please contact timberly@xtra.co.nz for quote. Click the button below to add the Dust Bee Gone Nuisance Dust Mask to your wish list.